More details have emerged about the contractual clause which has prevented Sheffield United from releasing Dean Hammond. The midfielder, signed on loan from Leicester City last season, was placed on the transfer list by new manager Chris Wilder last week after triggering an option entitling him to a further 12 months at Bramall Lane. Hammond, signed by Wilder’s predecessor Nigel Adkins, is understood to have informed United’s board of directors that he would be willing to accept a pay cut before the League One club published its ‘retained and released’ list on Friday evening. Although it remains unclear whether this offer was accepted, The Star can confirm Wilder was powerless to off-load the 33-year-old because the temporary agreement Hammond negotiated in October was loaded in his favour. The terms of that deal were designed to protect United’s interests had Hammond proved a success during his spell in South Yorkshire. But, following a series of disappointing displays, they also explain why co-owners Kevin McCabe and HRH Prince Abdullah Bin Mosaad Abdulaziz Al Saud, who heavily subsidised Adkins’ squad last term, recently overhauled United’s off-the-pitch operations. McCabe pointedly referred to the fact an “owner representative” will now sit on the technical board responsible for “selecting and recruiting” players after parting company with Adkins less than a fortnight ago. 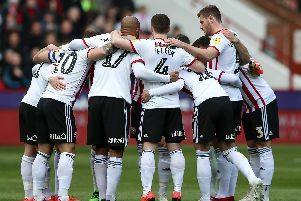 Wilder is set to embark upon a major rebuilding exercise this summer after releasing 10 players and telling another seven, including Hammond, they are free to look for other clubs, before the 2016/17 campaign gets underway.